Wisdom of the Moon: We Really Did It! Friday was a very good day. 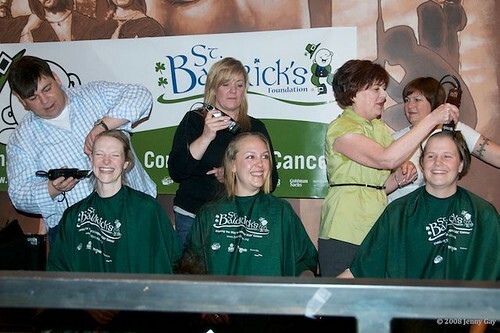 We showed up at St. Baldrick's with plenty of time to see the Avalanche players who were getting shaved, which, for me and Joey, was a very big deal. It was such a big deal to me in fact, that when I walked up to them to ask them to sign our shirts, I completely lost my mind. 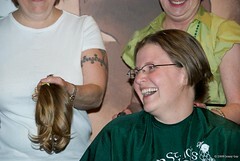 I had thought briefly about what I wanted to say, "We're getting our heads shaved too. Would you sign the back of my shirt? We're huge fans." You know, normal stuff. 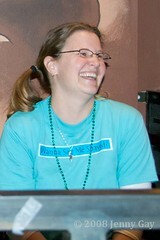 But the moment I started speaking, complete gibberish came out of my mouth. I used all the words I had intended, just not in the right order. What I said to Liles was, "Would you shave my shirt?" I guess it could have been worse. I could have asked him to shave my back. Anyway, they were still nice enough to not only sign the back of my shirt, but pose for a picture with Joey. It's a small miracle that the picture wasn't more blurry. 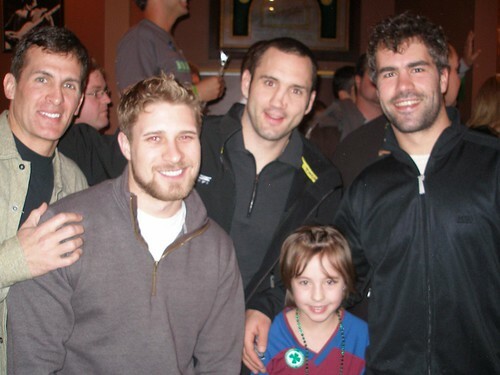 That is Tony Granato, John-Michael Liles, Ian Laperriere and Ben Guite, oh yah, and my daughter, too. I know that most of you probably have no idea who these guys are, but I was star-struck. In fact, I'd rather meet Ian Laperriere than Brad Pitt. His nose isn't as pretty, but there are more important things than pretty noses. Did I mention that the only reason we still have TV is to watch Av's games? We were set to get rid of it and then Forsberg and Foote came back. Oh well, maybe after the playoffs. OK, so just as a frame of reference, here's what we looked like the week before. 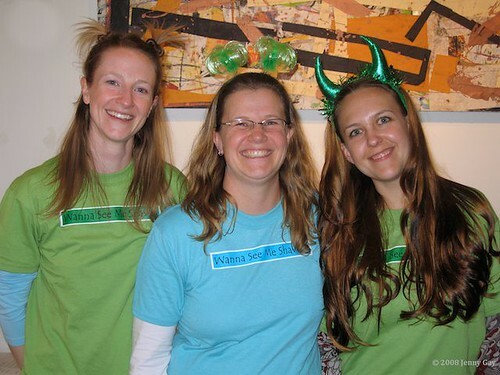 We wore these somewhat inappropriate shirts to get donations. When you wear these, people walk up to you and ask to give you money. 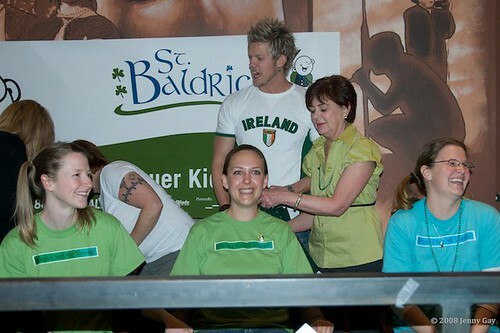 St. Baldrick's was loud and crowded and when it was our turn to get shaved, everybody cheered. Aurora immediately started crying (because she does that). I just couldn't stop grinning. 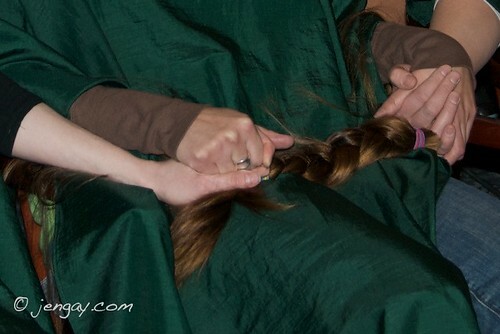 First, they cut off our piggy tails and braids and then they went to work with the clippers. So, here's the deal. 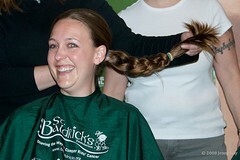 If you wanna see ALL of the pictures from Friday, you'll have to pony up over at St. Baldrick's. Then I'll send you links to the actual baldy pictures. 'Cause I'm mean like that. 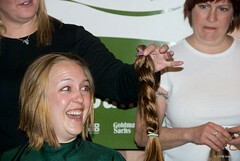 For those of you who've already donated, I should be emailing those links out shortly. Aurora, Jenny and I all thank you so much for your generosity! 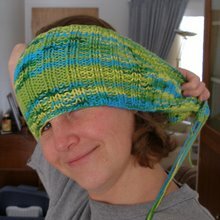 Help Cure Childhood Cancer and Win Prizes! This Sunday, Sunday, Sunday! Congratulations to all of you! You all look AWESOME with your heads shaved. You have inspired my husband and I to think about doing this next year. And I can't even say what a great experience the whole thing was. Being bald is so liberating! I LOVE BEING BALD! What a waist of water and time it was to wash all my hair. Little did we know we would be helping the environment also. You gals are all so beautiful! I am more than impressed. Never thought about the low maintenance part of it. No need for shampooing or conditioning. Just need to wipe your heads? F-ing Awesome! I can't believe how great you all look! How are the reactions from friends, family & strangers? Cindy, I wouldn't know. Every time I've taken a shower since Friday, I've put a big old glob of shampoo on my head. It isn't til my hand touches my head that I realize I have no hair to wash. Raw Vegan Mama, Jeff told me that he was really proud of me and that I had a lot of guts. At first, lots of family members (our kids and others) didn't want us to do it, but I think they're all glad we did. I can tell that some don't like the look, but what are they gonna do? Give us grief for helping kids with cancer? Strangers seem to smile at me more. Though, personally, I'm worried that I look like a skinhead. Maybe I'm being extra nice to make up for it. I'm trying to give off a Buddhist nun vibe. Basically, everyone wants to rub my head. I keep doing it, myself. Oh my gosh you DID it!! I have been checking back all weekend to see an update!! I'm flat broke (literally) but I'm so curious I'm headed over to make a small donation so I can see the end results!! I'm so excited to see it and I would TOTALLY do the same thing if my husband would let me :-P Seriously! You rock and I'm so proud of you even though I don't know you! congrats on the baldness!! I just DON'T have the guts to shave my head. I could go short, but bald is a whole other story. Congrats to you three, and I hope you can inspire lots of others to do this too! Now THAT is a post. Nice work to all of you! Congratulations! What a great thing to do, for such a great cause! My sister in law is undergoing chemo right now for Hodgkin's disease, so I've been targetting my donations to the Lymphoma/Leukemia society at the moment, but I certainly send you all my well wishes and warm regards! May the world be free of all types of cancer (literal and metaphorical) one day very soon.